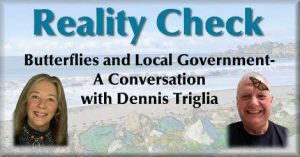 In this edition of Reality Check, we talk with Brookings City Councilor Dennis Triglia about current issues of public concern facing the City Council, as well as about Monarch butterflies and our status as one of the few towns on the west coast to be designated a Monarch City USA. The local monarch butterfly group, Brookings Oregon Monarch Advocates, has a Facebook group called Monarchs.me. People interested in starting their own Monarch Waystation can visit https://www.monarchwatch.org/waystations. The Xerces Society which is a non-profit environmental organization that focuses on the conservation of invertebrates considered to be essential to biological diversity and ecosystem health. Their website is https://xerces.org. The Monarch Butterfly Garden website is https://monarchbutterflygarden.net. The Southern Oregon Monarch Advocates website is somonarchs.org. The Monarch Joint Venture website is https://monarchjointventure.org. Anyone with specific questions about Monarch Butterflies can contact Denis Triglia at trigliad@yahoo.com. For questions regarding City government, contact Denis Triglia at dtriglia@brookings.or.us. Thank you very much for getting the word out about helping monarch butterflies! I work with Monarch City USA and we have been so pleased to work with Brookings, OR. Glad to do it. That’s what community radio is all about.